JASDF maintainers pose for a photo during the arrival of the first Japanese F-35A at Luke Air Force Base, Arizona in November 2016. 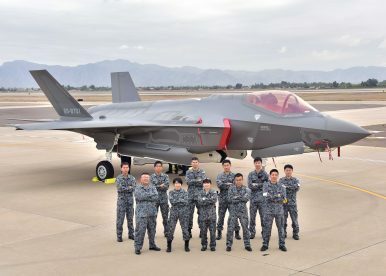 The Japan Air Self-Defense Force (JASDF) deployed its second F-35A Lightning II fifth-generation stealth fighter jet, the conventional take-off and landing (CTOL) variant of the aircraft, to Misawa Air Base in Aomori Prefecture in the northernmost part of Honshu in northern Japan on May 14, the Ministry of Defense (MoD) said in a statement quoted by IHS Jane’s Defense Weekly. According to the MoD, five F-35As, which are currently being used for training flights in the United States, will deploy to Misawa Air Base by the end of the month to form the JASDF’s first operational F-35A squadron, consisting of seven F-35A aircraft in total. (Two more F-35As are expected to join the squadron by the end of 2018.) The two JASDF F-35As at Misawa Air Base are presently conducting joint training with U.S. Marine Corps F-35Bs, the service’s short take-off and vertical landing variant of the Lightning II fighter jet. The U.S. Marine Corps operates a squadron of 16 F-35Bs out of Iwakuni airbase in Yamaguchi Prefecture, the service’s first overseas-deployed F-35B squadron. In March, a detachment of F-35Bs also deployed for the first time aboard the Wasp-class amphibious assault ship USS Wasp currently operating in Asian waters. In addition, the U.S. Air Force stationed 12 F-35As at Kadena Air Base in Okinawa for a six-month rotational deployment, which began in late October 2017. Japan is also considering purchasing at least 20 additional ready-to-fly F-35A stealth fighter jets from U.S. military aircraft maker Lockheed Martin over the next six years. There have also been reports that the MoD is interested in the F-35B for service on Japanese islands bordering the East China Sea and aboard Izumo-class helicopter carriers.